Description: Expert craftsmanship and a distinctive elegance come to light with a luxurious wall sconce that entices all to see. Exquisite Amber Quartz Idalight is enhanced with a frame, hardware and intricate scrolled accents featured in a Cajun Spice finish. 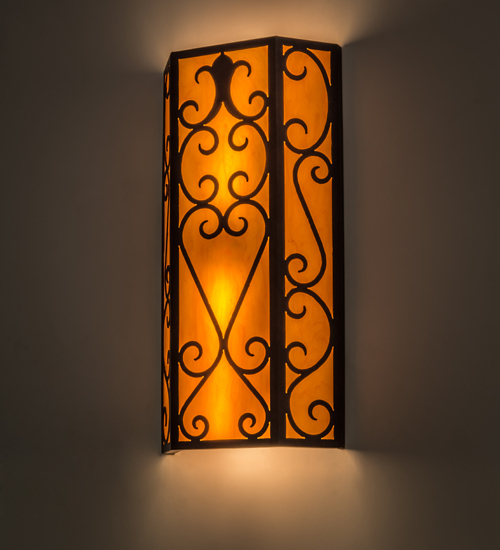 The wall fixture is custom crafted in the USA with highly skilled artisans. Custom styles, designs, colors and dimmable energy efficient lamping options are available. The fixture is UL and cUL listed for damp and dry locations.